Sound Choice to Bring a Hopeful Message in Autism Treatment and Prevention for Families in 2018. To view our interactive newsletter, please click here. 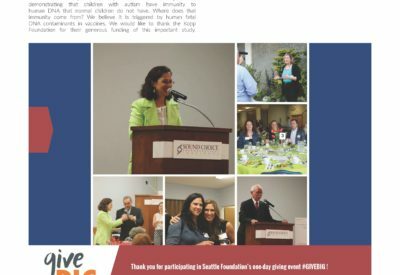 Featured article: As 2018 is approaching, SCPI continues to focus on the research and programs that provide real hope for autism treatments and cures, and prevention for future bundles of joy. We need your financial support to do this. What your donations have accomplished: a timeline of Sound Choice’s work and achievement from 2008-2017. A recently published clinical trial at Duke University has demonstrated that the majority of children diagnosed with autism spectrum disorder (ASD) are NOT BORN WITH IT. The team at Duke University treated 25 children with ASD with their own banked umbilical cord blood. The majority (2/3rds) of the children treated with their own umbilical cord blood improved in social communication, use of expressive vocabulary and eye-tracking measures. Some of the children had dramatic improvements so that autism no longer consumes 75% of their family’s daily routine, but now only 10%. Umbilical cord blood banking is the storing of a child’s cord blood for future uses such as autologous (self) stem cell transplants, applicable for treatments of cancer and other diseases. To treat cancer, high dose chemotherapy or radiation is used, which destroys the child’s blood cells in addition to killing the cancer. The child’s banked umbilical cord blood, which contains blood forming stem cells, is used to help their blood recover quickly to prevent infection. However, if the child was born with the mutation that led to their cancer they would not be able to use the child’s banked cord blood because the cord blood would have the same cancerous mutation. Over the past decade, numerous studies have been published that demonstrate that 60-70% or more of children diagnosed with simplex ASD have de novo gene mutations that damage critical genes needed for metabolism, cell-cell signaling and other important cell functions. The mutations that have been found in children with ASD were found by sequencing the DNA in the child’s whole blood. De novo gene mutations are mutations that are not present in either parent’s whole blood. The scientific community has assumed, without doing any studies, that the de novo gene mutations must have occurred in the egg, sperm or during early in utero development. Dawson and team’s recent clinical trial treating children with ASD with their own umbilical cord blood reveals the danger of erroneous conclusions and misguided research focus when scientists make assumptions without doing the research to prove their assumptions. 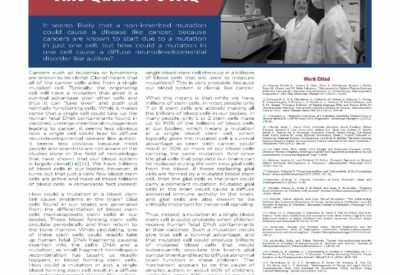 This clinical trial clearly shows us that the mutations found in the whole blood of children with ASD must have occurred after birth. What this means is that research should be focused on identifying environmental damage that happens after birth that leads to the mutations most scientists accept as the cause of the symptoms of autism. Autism is now a worldwide epidemic. Recently reported rates for India are that autism affects 1 in 68 children. Rates of autism in Africa, Asia and Southeast Asia are almost as high as in the US and EU. Autism struck third world countries affecting children right after humanitarian vaccination campaigns in those countries took place. The Duke University study should be a wake-up call to all of us. The primary trigger for the worldwide autism epidemic must be an environmental exposure that occurs after birth. The commonality among children around the world is that they are now almost universally vaccinated with measles vaccines that are manufactured using human fetal cells and contaminated with human fetal DNA fragments that are well established as inducers of de novo gene mutations. Why support SCPI? Because SCPI is the only organization doing the hard research to determine the environmental trigger for autism to protect our children and prevent future incidence of vaccine-induced brain injury. And, with our sister organization AVM Biotechnology, we are determined to provide the parents with promising affordable treatments, and hopefully, cures for these children./. SCPI stands for parents’ right to be informed about vaccine safety. Dr. Deisher, leading the team of Sound Choice Pharmaceutical Institute, continues to fight for the parents’ right to be informed about vaccine safety. On August 29, 2016, the Centers for Disease Control and Prevention (CDC) announced that they were taking public comment on the MMR vaccine. The comment period ended on Dec 19, 2016. The comment forum as well as citizen-cited publications can be accessed at CDC website at www.cdc.gov. “Since I heard about your studies on the introduction of human fetal DNA into the vaccines and time related increases in autism rates, I changed vaccine products and played with the schedule in my office. This was about 5-6 years ago. I have not looked at hard data, but the diagnosis of autism in my office has decreased from what appeared to be almost every week to maybe 2-3 per year. I have a mostly privately insured population and thus have control over the vaccines I choose to purchase for the office. Whenever I do see a patient who will get their vaccines, I recommend fetal free vaccines when possible. Hence, Sound Choice urges other pediatricians and family medicine practitioners to consider replacing Pentacel and altering the schedule of other fetal vaccines to see how their autism rates in their practice might be affected. Email Sound Choice at info@soundchoice.org for more information or to report your observations. Alternatively, tag us on Twitter by using #SCPIforPediatricians for your comments or questions. The Sound Choice team, along with other key players, encourages parents to recognize, demand and fight for the right to give fully informed consent when their child is about to get a vaccine. Parents have the right to know how their child’s vaccine is made and if it contains dangerous human fetal DNA and viral contaminants. For printed version, please click here. 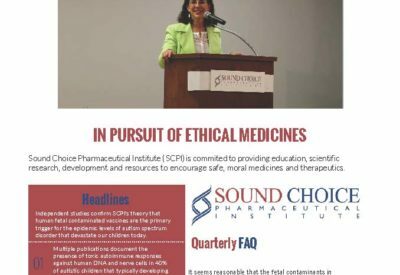 Sound Choice continues its quest to inform the public on vaccine studies. Our upcoming publication is a detailed summary of the talk presented by our Medical Scientist, Dr. Peter Jarzyna, during the American Association of Pro-Life Obstetricians and Gynecologists Conference in Houston in Feb 2016. The title of the paper is “Insertional Mutagenesis and Autoimmunity Induced Disease Caused by Human Fetal and Retrovial Residual Toxins in Vaccines.” Below is the summary of the paper. The current WHO guidance of less than 10 ng cell substrate DNA per vaccine dose is well exceeded by contaminating DNA levels in the rubella, mumps-measels-rubella (MMR), chickenpox and some hepatitis A vaccines available in the US.The chickenpox vaccine available in the US is contaminated with greater than 2 mg fetal MRC-5 DNA, according to the manufacturer’s measurements. This is 200 times more than what the WHO recommends in their guidelines. The unwanted DNA of the rubella vaccine is fragmented during the manufacturing process into short pieces of approximately 215 base pairs (in average) in length, which is ideal for cellular uptake and genomic integration. Recommendations to fragment the contaminating DNA arose from the concern that an entire cancer causing gene might be present among the fetal DNA contaminants. However, it has been scientifically shown that contrary to the integration of large DNA gene lengths, integration of short DNA fragments has been demonstrated to be much more efficient. Furthermore, two vaccines (hepatitis A and rubella) are also contaminated with fragments of the Human Endogenous Retrovirus K (HERVK), a retrovirus that invades the genome of its host, can be re-activatable and which can facilitate the integration of foreign DNA into the host’s genome. HERVK is in the same family of retroviruses as the MMLV virus used in the gene therapy trial, in which inappropriate gene insertion led to subsequent additional somatic mutations and cancer in 4 of 9 young boys. Short DNA fragments are known to integrate into the genome in a species specific manner and can lead to an autoimmune response as well as mutagenesis and/or genomic instability. As covered in detail in our last newsletter, the vaccine schedule exposes young children to insertion of fetal DNA fragments during a time of significant brain development. 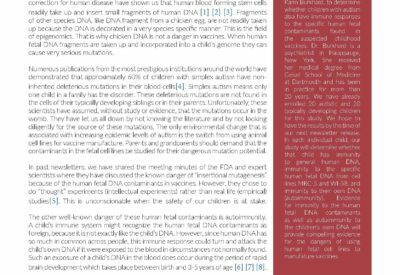 Despite the overwhelming body of scientific literature clearly demonstrating the high probability of autoimmune and/or insertional mutagenesis dangers from these contaminants, retroviral fragments as well as residual human diploid DNA are an unstudied risk to vaccine recipients. This is an unacceptable danger that undoubtedly cries out for serious epidemiological and scientific investigation. is to disclose fetal DNA quantities in vaccine package inserts. Moreover, we emphasize the fact that alternatives are already available and manufactured in other countries. A rubella vaccine available in Japan clearly demonstrates that vaccines can be safely and effectively manufactured in animal based cell lines, eliminating the dangers of residual human DNA and retroviral contaminants. This Japanese vaccine is based on Takahashi strains of live attenuated rubella virus and is produced on rabbit kidney cells . It has been recently proven that while Japan implemented the single-dose rubella vaccination program until 2006, a single dose of this vaccine was capable to retain immunity for at least 10 years when rubella was under regional control. SCPI is currently conducting a study to provide further clinical proof for autoimmunity caused by fetal DNA found in vaccines. Thank you for helping us CREATE A BETTER WAY for biomedical progress! 2015 has been a year of painful struggles for us, but also a year filled with many advances and victories. We lost my beloved son Henry Joseph on July 3, but we were blessed to have the Henry J. Streuli Cancer Research Memorial Fund created in his memory. We have already launched the first preclinical studies to test a novel compound for its ability to send germinal center lymphoma cells into the blood stream where they will be easier to kill. Henry’s suffering may help others suffer less and that is a great blessing. On July 25 we lost our loved and long time scientist Kumiko Koyama, but we were blessed by the outpouring of support from all of you. We keep her picture prominent in the lab to remind everyone, as Kumiko did regularly, to work harder, do better, and to continually challenge ourselves. Help us make 2016 the year when the idea of exploiting another human being for biomedical progress becomes UNTHINKABLE! Help us continue to discover and develop better alternatives. #PP still sells baby body parts : We must provide alternatives if we want to stop human exploitation justified for biomedical progress. Despite the recent exposé of the harvesting of body parts from babies with beating hearts, on Sept 28th Congress backed down and funded the government as well as the organization responsible for such atrocities. Pro-choice or pro-life, no one condones such callous harvesting of another human body. Congress is waiting for better alternatives before they take action, as they have waited for decades. We at Sound Choice are close to bringing our first alternatives to clinic – YOU can help us get there. Right now the best bang for your buck is to support Sound Choice Pharmaceutical Institute. Advocacy is wonderful, exposé is wonderful, testimony of prolife groups to Congress is wonderful, but as we have seen repeatedly, those organizations can’t stop human exploitation as long as there is a market demand. Sound Choice CAN beat them in the market. We CAN provide better, safer alternative medicines. We need YOUR support to get there. Ethical alternatives are safer & more affordable. Alternatives sound like a no-brainer to me! Kissling RE, Casey HL, Palmer EL. (1968) Production of specific varicella antiserum.Applied Microbiology 16(1):160-162. Barker Roger A. , Drouin-Ouellet Janelle, Parmar Malin. (2915) Cell-based therapies for Parkinson disease-past insights and future potential. Nat Rev Neurol. 11(9):492-503. doi: 10.1038/nrneurol.2015. July 2015 Newsletter – What can YOU do to stop Planned Parenthood’s heinous practice of selling fetal body parts? What can YOU do to stop Planned Parenthood’s heinous practice of selling fetal body parts? Will our elected officials and church leaders take action UNLESS alternatives are available? Sadly, the answer is NO. What does the secular press say about SCPI and AVM Biotechnology?